A short week of rest for Seattle in Week 7 as the Hawks head to Santa Clara to take on the 49ers. Both teams are struggling so far with each owning a 2-4 record. The similarities in their respective seasons end there however, as the Niners’ season was expected to be a down year while Seattle was a favorite to return to the Super Bowl. With a mass exodus of both coaching and player talent this offseason, the 49ers were picked by most experts to be lucky to win 7 or 8 games on the season. The loss of Jim Harbaugh was the biggest blow, as he went to Michigan and turned them immediately into a powerhouse…leaving Santa Clara with no one of equal caliber to replace him. The Hawks stagger into Santa Clara after yet another 4th quarter collapse this time at the hands of Panthers. Seattle has no coherent offensive identity, lacking consistent play-calling from the offensive coordinator Darrell Bevell. Their defense is a big question mark, as they’ve lost the last two weeks in the 4th quarter, with comfortable leads. This match-up of two former powerhouses may turn into quite the game to watch. But as the picture shows up top, its clear who owns the field when these two play. 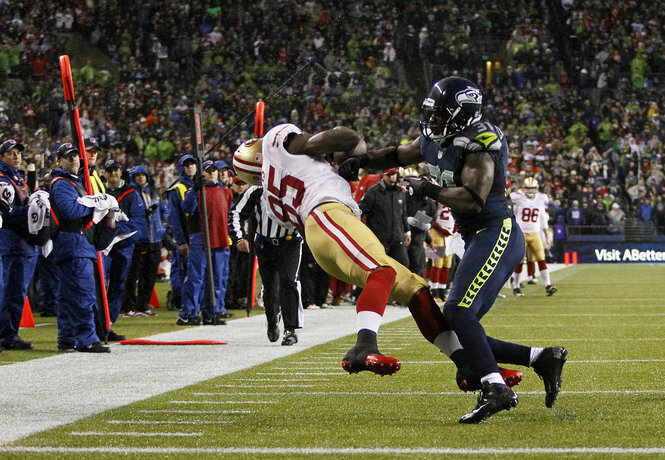 The 49ers are essentially a mirror of the Seahawks on offense, but with less talent. They lead with the run and make every attempt to mix-in the passing attack as a supplement. San Fransisco currently owns the 12th ranked rushing offense in the NFL and are a pathetic 29th overall in the passing game. What made the rivalry truly great was the philosophy of both teams. Both were built with smash-mouth rushing attacks and gifted possession receivers. They also had extremely mobile quarterbacks to add the extra dimension to the rushing attack. There’s been some big turnover at the skill positions for the Niners this year with future Hall-of-Famer Frank Gore gone to Indianapolis and Michael Crabtree shown the door in free agency as well. In their spots come Carlos Hyde and Torrey Smith, both solid players but lacking the higher ceiling of their predecessors. Hyde is a solid RB but lacks the intensity of Gore. Smith is viewed by many as only a punt returner and nothing else. At the helm is still Colin Kaepernick who has struggled at times with confidence in his receivers and his play. He’s enjoyed a small resurgence the past few weeks with a big game last week against Baltimore. Kaepernick passed for 340 yards with 2 TDs and no interceptions while showing good judgement and made no mistakes. He’s dangerous, and the Hawks should be prepared to always have a spy on him. This is the area where the Niners have really fallen in the past year. They lost their defensive minded head coach and proceeded to lose players at the pace of what seamed like once a week during the offseason. Some losses were due retirements that were probably a tad early like Justin Smith, the heart and soul of the defensive line. Patrick Willis falls under that same category as he probably just didn’t want to go through another rebuild. Aldon Smith was lost due to his continued legal troubles off the field. Chris Borland was one of the biggest shockers as he was only one year into an extremely promising career, but retired due to concussion concerns. Take that many star players away from any defense and they’d be reeling. The 49ers are in fact doing that, currently resting at 15th overall in rush defense and 32nd (LAST!) defending against the pass. There’s still is some fight to the San Fransisco defense now led by Navarro Bowman. Bowman is not the same force he was before the 2014 NFC Championship Game but he can still play with the best of them. His presence up the middle means the Hawks will still have trouble rushing without some kind of passing attack to keep them honest. As for passing, the 49ers’ secondary has definitely taken a step back with the loss of Chris Culliver to free agency. Kenneth Acker has tried to fill the role but has been exposed a bit. Expect San Francisco to bring the pressure as this will be one of the few weeks this year their defensive front could pick-up some sacks. But don’t expect that pressure to match the intensity we saw from the Rams. Contain Kaepernick; some way, some how. The coordinators at Santa Clara have been hammered enough by the press and outside advisers that they have finally figured out to keep Kaepernick mobile. When he runs, this offense is a different beast, and the Hawks need to be prepared for that. Establish an effective passing game. The 49ers have the 32nd ranked pass defense in the game and Seattle needs to exploit that as much as possible. Find a way to finish the game. The Hawks have a finishing problem and they need to figure out how to close the deal and maintain a lead late in the game. Last week Seattle had the ball with 3:55 left in the game and only managed to burn 1:30 seconds off the clock while trying to close the deal. Offensive play-calling was the issue here and clock management. Resolve those issues and the Hawks have a better chance. Santa Clara 49ers Secondary vs Seattle Seahawks WR Corps. With the Niners’ struggles on pass defense this is where the game will really be decided. Last week Jimmy Graham was a serious force and this week he can do even more damage. Even with the recent dysfunction in all aspects of the game, the Hawks still outclass the talent left on the 49ers roster. Follow us during the game @SeattleSideUp on Twitter and watch us Sundays at 8:30pm (PST) on YouTube, as we discuss this game and all things Seattle sports.